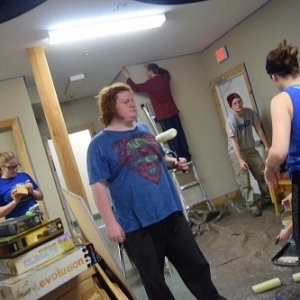 University of Maine at Presque Isle students put a brand new spin on their Spring Break this year, using the week generally associated with beach parties to explore experiential learning opportunities. For the very first time, a group composed of six UMPI students and two staff members participated in an “Alternative Spring Break” funded by the Student Government Association. The group traveled to the Bryant Pond 4-H Camp and Learning Center to complete service projects for the upcoming camp season. Over a period of four days, the group painted the interior of a multi-purpose building and removed snow from the entrance of the dining hall. In addition to the service projects, the group did team-building each afternoon, which included activities such as archery, rock climbing, and nature walks. The students prepared all of their meals together, and stayed in the newly constructed lakeside lodge during the trip. Near the end of their trip, the group traveled to Portland for the day, where they visited the Southworth Planetarium and The Escape Room. The students had free time in the Old Port between the Planetarium and The Escape Room, and they enjoyed good weather among the cobblestone streets. When they hit The Escape Room, they participated in a timed activity where a group has 60 minutes to solve a set number of puzzles to escape the room. As a group, the students chose to enter a room with an Egyptian theme. Together, they had to solve puzzles to find the numerical codes that would unlock the door. After successfully completing the Escape Room, the group went to a sit-down dinner in Portland before heading back to Presque Isle. “The hope is to build upon these trips each year. It would be amazing to have an international spring break service trip someday, but we have to start small to grow big,” Forkus said. 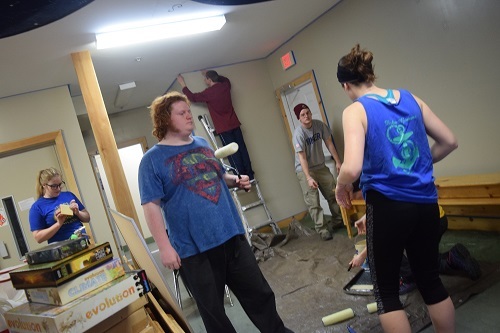 For more information about Alternative Spring Break, or the UMPI AmeriCorps VISTA program, please contact Forkus (AmeriCorps VISTA, Early College Initiatives Coordinator) at 207-768-9602 or victoria.forkus@maine.edu.